Happy Saturday! Because of the rising popularity of K-drama and K-pop, these have paved a new wave of fashion - Korean fashion. From their hair to makeup to clothes, the Koreans have been inspiring many around the world to start dressing like them. And thus, Esgesee.com is born! Esgesee Fashion is an online fashion wholesaler and drop-ship service company based in Malaysia that focuses on selling ladies wear namely, Japanese and Korean clothes. With an aim to provide a wide range of trendy Korean fashion products and service to the nation wholesale companies and retail shops, Esgesee works hard to ensure high quality customer service, trustability with clients and good quality products. The best part is that the prices are super affordable and they're all ready stock! All products are quality assured with their zero-defect policy whereby Esgesee will ensure perfect sewing for you! They also ensure next day delivery with the lowest shipping rates and an efficient customer service whereby they're always ready to answer your questions, literally everyday. Did I mention that they deliver to Brunei, Indonesia and Singapore too? Here are a few items that I spotted and have thus added them to my wishlist! Esgesee have thousands of items, from tops to skirts to jackets to dresses, to suit just about any occassion. Everyone needs a jacket for class because admit it, it's like freaking North Pole in there. 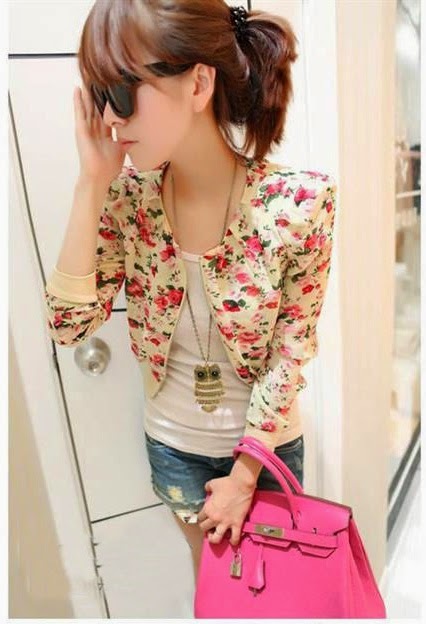 A simple jacket with floral prints will make any lazy-day outfit instantly interesting! I love maxi jersey dresses and I can't belive this is so much cheaper than the one I got -_- It's a good look for shopping and because of the plain design with side slits, you can wear this with almost any accessories, shoes or bag you like. I've always wanted a classic feminine cut blazer for not only work but other formal events too! You can just wear it with a short dress and when you take the blazer off, you're ready to party for the night! Looking at the pic, you can tell that the dress is made of quite a thick material and has little gem embellishments on the collar. And guess what? It's only RM31! Your date will adore you for putting in a little bit of effort to look good for your day out in this cute and feminine ensemble. Turn heads with this classy dress with diamond embellishments. It's only selling for RM37 on Esgesee?! *jaw drops* I'm so turning to them for my next prom dress! There are many more clothes from Esgesee that I wish I could show you but it's even better if you see for yourself, right? One thing I noticed though, is that the sizes are mostly from M-XXL, so bad news for petite girls like me :( Some tips are to look hard for nice clothes and for me, the really nice clothes are at the last few pages. Remember, you can never go wrong with basics! There are two ways that you can order from Esgesee. If you sign up as a normal customer, the minimum that you have to buy is 10 pieces while for prepaid members (dropship agents only), you can use your credit balance to purchase a minimum of one piece only. Payment can be done via bank transfer, Maybank2u, credit cards and even PayPal. Korean lovers, hurry over to Esgesee to get your fave items soon! For more information, log on to their website http://esgesee.com/ and Facebook to get the latest updates.